The next phases of the renovation project are getting underway this month. Pictured is our electronic signboard, which was sent out to be updated. After the new QLine station was built blocking the sight-line for the sign, the private corporation that built the new trolley offered to pay for us to elevate the sign so it can be seen over station. While we were getting estimates to do that, we also entered into an agreement to have it updated with newer electronics (the electronic sign panels were failing and replacements no longer being made) which will allow for a higher quality resolution. The face of the sign is also being expanded to allow the changeable electronic portion to be a larger square, rather than rectangular. 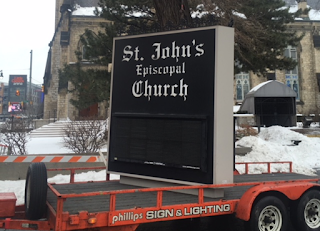 The restored sign should be installed in the next few weeks. The next project is the 1971 Office building. Thanks to parishioner Terri Palmer Burton, Palmer Moving came last Thursday and took away furniture and boxes to be put into storage. In the next week or two the Office Manager and the Treasurer will move into the classroom in the undercroft and phone/Internet connected in there. My office will be in the acolyte sacristy next to the chapel entrance. Also, last week a key lock was installed on the garden narthex door to the church, where the new handicapped ramp is located. This will allow us keyed access to the building during construction. Until this, the only way to get into the building with a key from the outside was through the office building. Demolition work on the interior of the office building will begin shortly thereafter so that the entire upstairs and downstairs will be renovated into useable and attractive space for ministry. I hope everyone will be patient as we will all be inconvenienced in one way or another with this construction. Hopefully we can keep focused on how great the results will be… well worth the occasional trouble of using a different entrance or finding/not finding something we thought we had stored for use during this project. If you have questions or concerns, please speak with Dave Schafer (project coordinator), or with me, so as to avoid rumor and gossip, causing unhappiness.